When driving up Hwy. 68 from Hwy. 40, I have always had my eyes drawn to the north ridge of this hill because it is open for the most part. How to reach the bottom of it without a horrific bushwhack through deadfall? That problem was solved when a logging road was pushed up the valley to its west, which is marked as Stony Creek on the topo map. Actually the road and its offshoots extend to the valley to the northeast. Up there, on the north side of the hills there is a HUGE area of clearcut that can’t be seen from the highway. The road starts at 418565. And you need follow it uphill only to the bend at 428560. From here either climb onto the ridge to the east and follow it SSE over a crag-lined top to a col, or climb diagonally right below the ridge and top to gain the col. Either way, the going is a pleasant mix of meadow, and aspen-pine mix with grass underfoot. From the col head up through a belt of open trees to a glade where a trail starting from the bottom left-hand corner takes you up through a few more trees into the big meadow. We went up the ridge proper at the left edge of the grass where it was less steep. On top is a flat meadow with inukshuk and a metal post with flagging used as a marker by heli-yoga groups. When doing the Hunchback Horseshoe, the route crosses this hill closer to the tree edge. But no need to look for the summit in the trees. This flat is the best place to stop and admire the view to the west and north. We spent a good hour here, doing nothing much, just enjoying the fine Fall day. A breeze wasn’t apparent, but lying on my back, I watched hawks spiralling up into the deep blue until they were lost to sight, and fluffy white seedheads wafting across my vision from west to east. It was hard to leave. 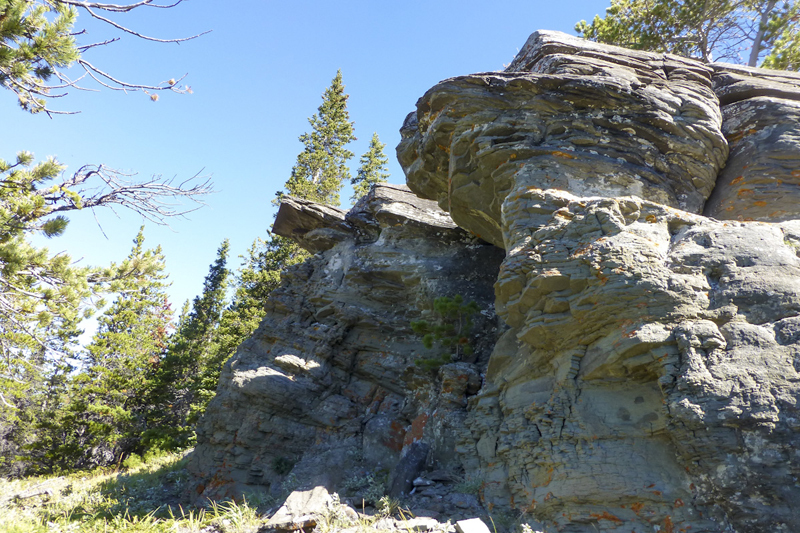 Especially as we weren’t going back the same easy way, but instead were trying out the NE ridge which proved to be riddled with deadfall and alder. We didn’t bother marking it on the map. 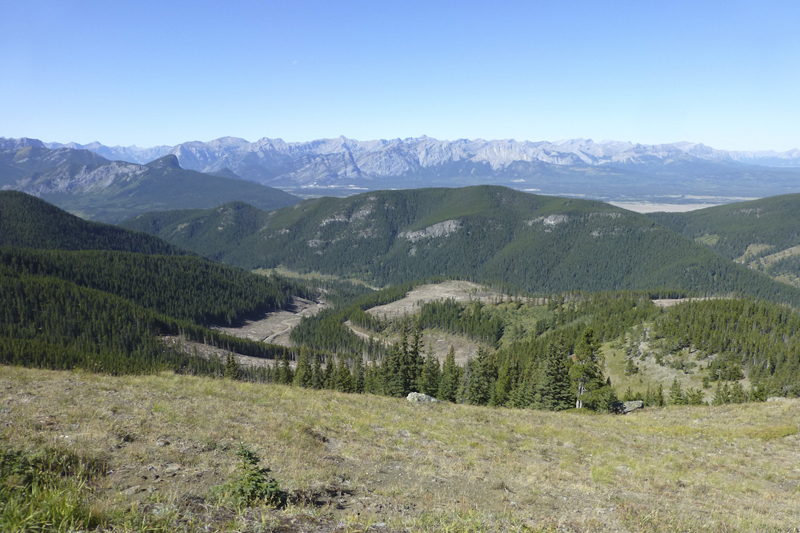 Being north facing, this logging road and others would be good for snowshoeing and skiing. Not so sure about the ridge. Anyway, it will be fun to try it out. But best do it soon before the road is rehabilitated. Shows ridge route. You can also (especially on the descent) traverse below the ridge to/from the col.
It’s November 2018 and logging has begun on the Hunchback Hills. 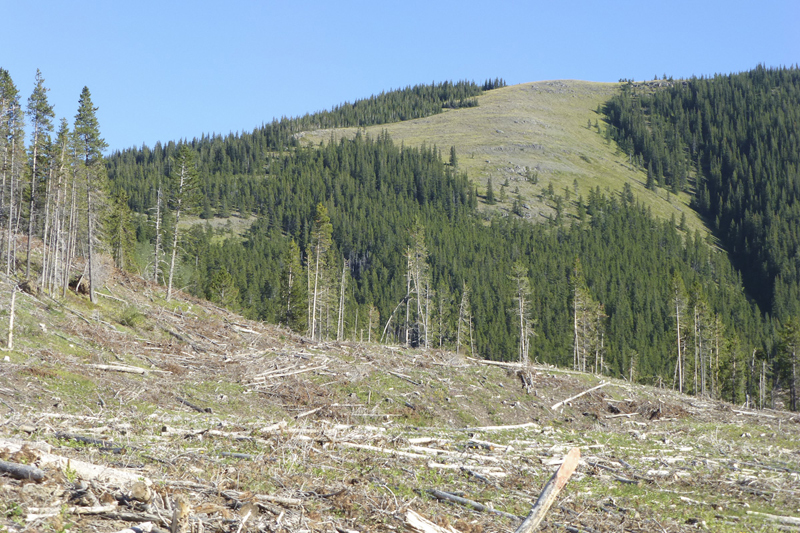 A logging road has been bulldozed in at a higher level than the Lusk Pass trail, so that trail remains unaffected apart from two logging road crossings. If headed for the South Lusk Meadows you can still turn off at the usual place. If going up Hunchback it’s a different story because a small section of forest the trail travels through has been logged even though the block isn’t shown on the SLS map and of course that first uphill has been bisected by the road. So as follows: Take the logging road to 429507. Turn right up a slip road leading into the cutblock. A little way up turn left and follow flagging around the left perimeter of the cutblock to its high point where the Hunchback trail resumes on what is the second uphill. The distance is short — only 110 m. The flagging is ours and though we did our best to clear the route of deadfall in the time we had, it still needs work. Possibly the cutblock will be cleared of slash and little log piles at some point and then we will be able to forge a new trail up the middle of it. The logging road will be there for at least three years and although there is vague talk of using all or part of it as the new Lusk Pass trail to the camping meadow I wouldn’t bank on it and we’ll be back to starting up Hunchback from the trail. Incidentally. someone has dismantled the cairn marking the start. Map and pics will follow next Spring. 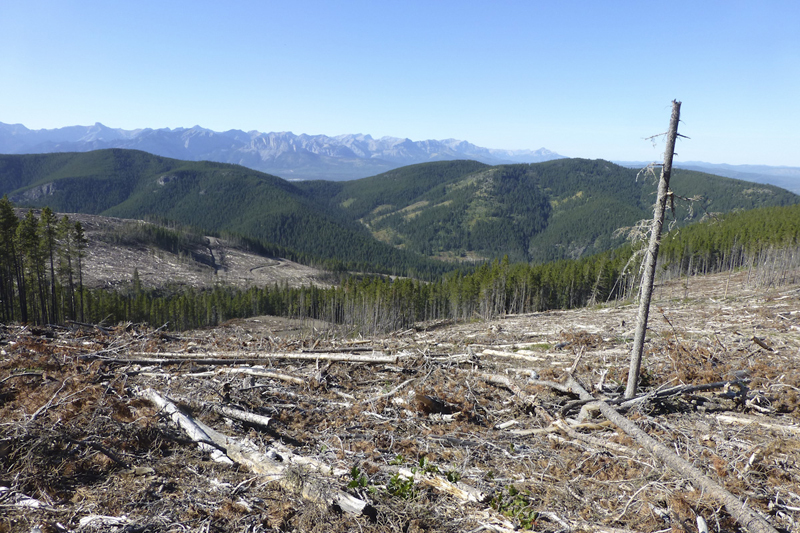 As will a description of logging roads being pushed into the centre valley between the horseshoe. Logging is a couple of winters away, but it could be brought forward. do you know when they intend to log this area is that what all the pink and black striped tape is for? it seems to be everywhere, the camp site up in there is great and very quiet but not really safe to have a campfire there at all. Yes, the route up the ridge from Lusk Pass trail at the cairn 730 m in from the trailhead has now become the popular way up with a developing trail to open slopes. Also works really well as a microspike plod when snow-covered before the road closes. Future logging looks to avoid the route. However, realignment of Lusk Pass trail during logging may affect the start. I was up there a few days ago the trail is very easy to follow from the powder face trail end , head west on the lusk trail and you will come to a good sized cairn head right and follow the flagging I cleared many many dead fall trees and marked the trail where it was a bit vague the view from the top is amazing I can see this trail becoming very popular over time. 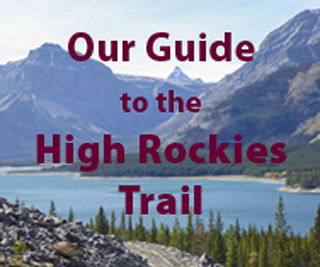 Didn’t do this particular route but did hike up to Hunchback Hills summit today per route #76 in Kananaskis Country Trail Guide 4th Ed Vol.2. Great hike, good flagging in central portion as far as first viewpoint (altho no – or very limited – flagging visible on lower slopes from equestrian campsite). 4-6 inches new snow up there today. Views of swirling cloud and mountaintops appearing and disappearing. Awesome sight. Highly recommended hike. Look forward to trying out Hill 435554 per your route above.